The episode, entitled iMeet the First Lady, sees Carly’s dad, Colonel Steven Shay not able to make it home for his birthday as planned. Carly’s friends Sam and Freddie hack into a secure military website to set up a web chat so Carly can speak to her dad, but they get into some trouble. 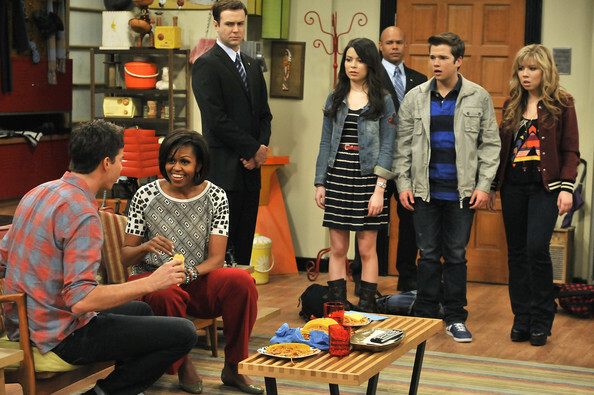 Mrs. Obama, who hears about Freddie and Sam’s efforts to connect Carly with her dad, then comes to talk to them about the importance of connecting soldiers with their families and saves them from getting into too much trouble. They invite her to guest star on the next iCarly web show. Michelle Obama filmed the scenes back in June 2011. The episode will broadcast in American on Nickelodeon on January 16, 2012.